Item shown above : Natural Hardwood - Mahogany FINISH with black color felt background. (Figurines and collectibles not included). 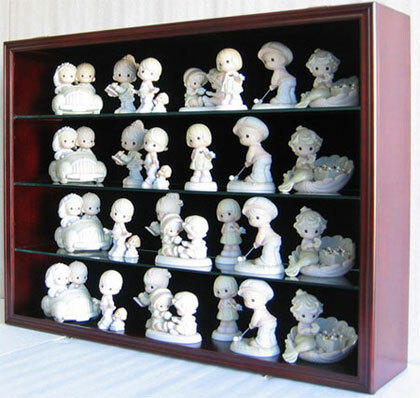 The display case has a interior depth of 6 inches, provide plenty room for Large collectibles. Carefully crafted from solid wood, it would be perfect to showcase collectibles in different sizes. When hang on the wall it is just like a gallery itself. It has a hinged UV Protection Acrylic door to prevent inquisitive fingers. The hinges are on the top of the display case and the door latches are on the bottom. The glass shelves are removable. Built-in Lock. Wall brackets on the back of the display case for wall mounting. No assembly required. Space between shelves: 5 1/4"